TIANJIN, China, August 17, 2015 (ENS) – The death toll has risen to 114 after a warehouse storing hundreds of tons of toxic chemicals exploded last Wednesday in the Chinese port city of Tianjin, about 90 miles southeast of Beijing. Another 700 people are still hospitalized, 57 of them in critical condition. Wang Jiancun, director of Tianjin Health and Family Planning Commission, said 77 people have left the hospital after recovering. Many nearby buildings were damaged in the blasts, and thousands of cars were destroyed. The explosions have affected 17,000 households and some 1,700 businesses. At least 6,000 residents have been displaced. More than 2,000 soldiers and police officers have been deployed to clean up an area with a radius of three kilometers, Shi Luze, chief of staff of the Beijing Military Area Command, told the official state news agency Xinhua. “Navigating through the blast zone is extremely dangerous because of the burning chemicals and twisted containers, which could collapse at any minute. We had to make marks in order not to get lost,” said Wang Ke, who leads a group of chemical specialist soldiers. 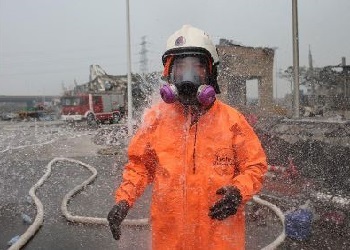 The Tianjin environmental agency said it is monitoring Monday’s rainfall and its possible effect on the toxic materials. One of the chemicals at the site, sodium cyanide forms toxic gas in the presence of water. Nearly 700 tons of sodium cyanide have been found in the explosion site. Sodium cyanide releases hydrogen cyanide gas, a highly toxic chemical asphyxiant that interferes with the body’s ability to use oxygen. Exposure to sodium cyanide can be rapidly fatal. Crews are using hydrogen peroxide to neutralize the toxins and building cofferdams to enclose the damaged barrels of chemicals, said Shi with the Beijing Military Area Command. Biochemical crews searching the blast site central area have collected all toxic chemicals they could find. At least 200 more biochemical troopers arrived today to clear chemicals around the edges of the site. Tianjin Vice Mayor He Shushan promised at a press conference that all dangerous chemicals in the outer area would be gone by Monday evening. Crews are testing air quality and water quality in nearby rivers to see if the pollutants exceed national standards. Premier Li Keqiang visited the site on Sunday afternoon. He ordered the swift release of information about the explosions. Li told the environment staff to keep monitoring the environment around the clock and release accurate, authoritative environment information as the public are highly concerned about the air, water and soil quality around the blast site. Port operations and ship traffic were partially suspended following the explosions, but operations at the Tianjin port returned to normal, the port authority said Monday. The State Council, China’s cabinet, has set up an investigation team to find out what caused the explosions.